Spray Sunscreen with Insect Repellent - 0.34 fl oz. Branded logoed lid entices people to look inside this sun care and bandage kit. 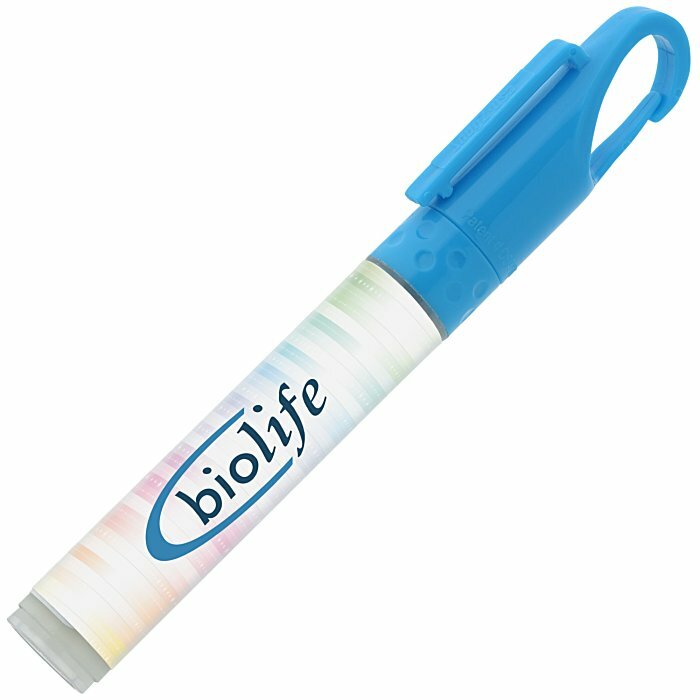 This promotional sunscreen makes a great giveaway at company outings, festivals, beach parties and other outdoor events! The broad spectrum sunscreen features SPF 50, protecting you from the sun’s harmful rays. Also acts as insect repellant, keeping pesky mosquitos away while you enjoy the great outdoors. Sunscreen sprays directly on the skin for easy application. Features a pocket clip and a hook clip for secure carrying. Each frosted clear spray tube holds .34-oz of sunscreen. Your price includes a full-color imprint on the label.